Substantial information regarding the history and source of organic matter and transfer of both carbon nitrogen to and within marine environments lies in the chemical and isotopic signals of organic materials. Origins and diagenetic histories of organic materials can be assessed on a bulk basis, using molar ratios of carbon to nitrogen and stable isotope compositions, or on a molecular level, using characteristic molecules or compositional changes to indicate the major processes occurring in the sedimentary deposit. More recently, clear identification of the preservation of particular components has been achieved, and the processes involved with the formation of an organic deposit have been established through the isotopic characterization of the compounds themselves. This chapter endeavors to lay a foundation for such molecular isotopic approaches in studies of the early diagenesis of sedimentary organic material. 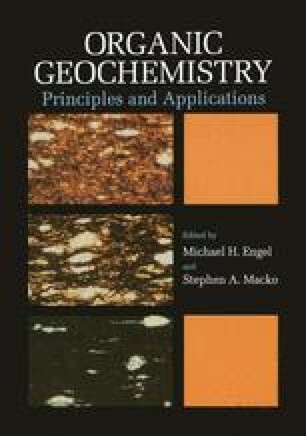 Specific details on molecular carbon approaches, especially those having to do with lipid characterization, are discussed in other chapters of this book [see chapters by Brassell (Chapter 34), Hedges and Prahl (Chapter 11), and Meyers and Ishiwatari (Chapter 8)] or larger compilations related to the field of marine organic geochemistry (Eglinton and Murphy, 1969; Duursma and Dawson, 1981; Brooks and Welte, 1984; Tissot and Welte, 1984; Sigleo and Hattori, 1985; Sohn, 1986).